♫Strong Bass: BT809 bluetooth headphones use latest 4.1 bluetooth chip and the unit 4.0 diameter driver, which bring you the powerful strong bass, crisp and clear sound. ♫Bluetooth Headphones: Using the Bluetooth 4.1 technology, strong wireless signal, fast and stable. You can enjoy skip-free music in a 33 feet working distance. Aita BT809 bluetooth headphones is easy pairing with smartphones, tablets and other Bluetooth-enabled music devices. 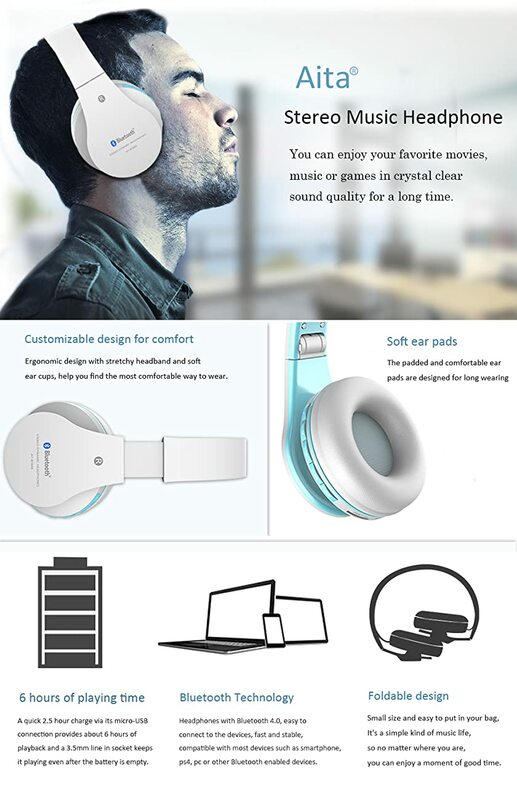 ♫Multifuntion: This over ear headphones with Mic can make hands-free calls, picking up, ending and rejecting a call with ease, you can use it to listening to music, play games, even listening FM radio. And we add a TF card port on its earbuds for running, jogging, cycling, driving. ♫Long Battery Life: Aita BT809 wireless sport headset with the rechargeable polymer lithium battery, usually it takes 2 hours to charge, and allow 8 hours playing time. Don't worry about the headphone battery always ran out on the half way of your travel. BT809 works in wired mode with included charging cable. It can be use a wired headsets with iPhones android smartphone MP3 players PC and laptop. ♫Sport Headset for Running: Foldable earbuds design saves more spaces for your bag or car. And the ear cups which is padded with sufficient foam and covered with soft leather to provide a long time comfortable wearing experience. Ergonomic design optimized for ultimate wearing comfort to match your active lifestyle like running, jogging, cycling, driving, camping, hiking gym exercise and other outdoor sports.